Thrifty Drug Store – Southern California 1940’s, originally uploaded by A Box of Pictures. 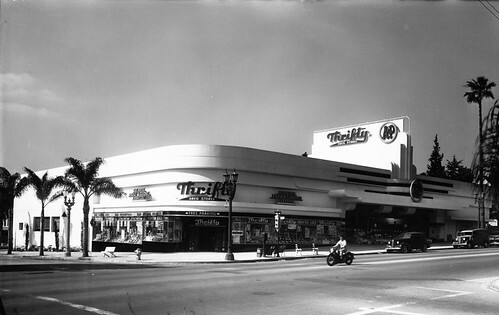 A photo of what Thrifty Drug Store looked like at the corner of Farifax and Sunset in the 1940s. While they are still building new drugstores in Los Angeles, the architectural quality is nothing compared to what it once was. And the old style respected the pedestrian and was an ornament to the passerby, a gathering place for the community, a clean and well lit store with discreet and stylish signing. The condition of many Rite-Aids and CVS throughout Southern California is less than appealing. They usually present an oil stained and litter filled parking lot as an entry way along with plastic signs, and a drive-up non-functioning pharmacy where you refill your $430 cholesterol prescription. CVS, Walgreens and Rite Aid are big business, earning tens of billions as they collude with the insurance and pharmaceutical con men to bilk the consumer out of money. Yet most of the stores cannot even afford to paint their exterior or sweep their sidewalk (if they have one) and their presence today and these photos from yesterday are raw evidence of the decline of American society.